During Victorian times, specific flowers given conveyed secret messages or codes, commonly referred to as the “Language of Flowers.” Purple lilacs represented the first emotions of love, while white lilacs symbolized youthful innocence. Like the rose, the lilac is an exceptionally fragrant flower. As a cut flower, the lilac will stay fresh a relatively short time. Keeping it in water with a floral preservative will help extend its fresh appearance. Drying the cut flower can preserve lilacs for weeks, months and sometimes years. Dry the blossoms immediately after cutting from the bush. Select lilacs that have just reached their peak or are slightly immature. Don’t attempt to dry a bunch of wilted flowers. Cut a bunch of lilacs from the bush and secure the bottom of the bunch with a rubber band or piece of twine. Clip the bunch (upside down) to the bottom of a clothes hanger, using a clothespin. Hang the clothes hanger in a warm, dry, well-ventilated area out of the direct sun. The bunch of flowers should be hanging upside down. It will take one to three weeks for the flowers to dry. 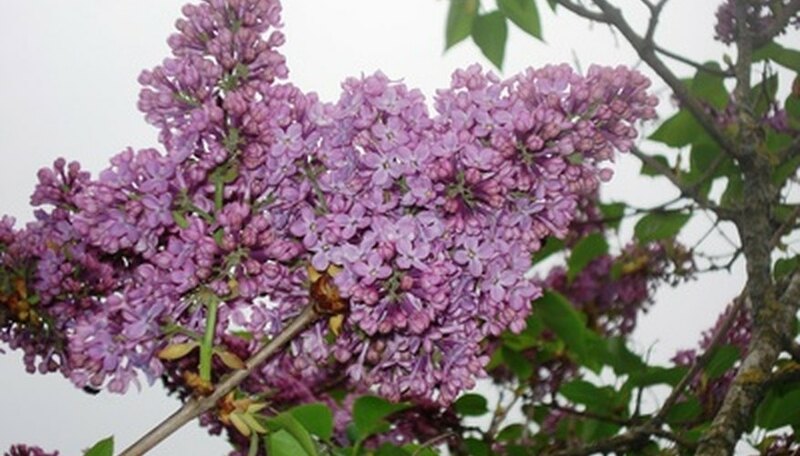 Select lilacs that have just reached their peak or are slightly immature and cut from the bush. Pour a layer of silica gel into an airtight box, about an inch deep. Snip the small individual lilac blossoms from the bunch, leaving about an inch of stem attached. Set each blossom in the silica gel, stem first. Do not allow the flowers to touch each other. Cover the blossoms with a layer of silica gel. Place the lid on the box and store in a cool, dark, dry location. It will take about two days for the lilacs to dry.